I’m making this a quick post to share a non-typical purchase I made earlier this week. Rewind a bit to earlier in January of this year. I attended a local doll show where I purchased a couple of vintage fashions from a vendor I purchase from regularly when the doll show comes around my way in Winter and Summer. In January I posted a picture on my Instagram account of a MOD fashion that jumped out at me … no pun intended …. “Jump Into Lace”. 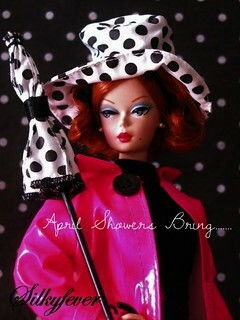 MOD Barbie fashions are not on my radar, mainly due to the fact that MOD Barbie’s are not on my radar. Ever really. 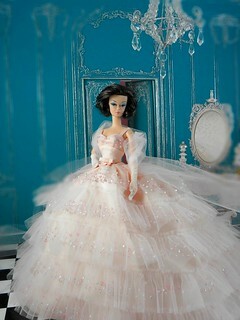 But I bought the fashion on a whim, and then when I got home, I realized I had no proper doll to wear the fashion. 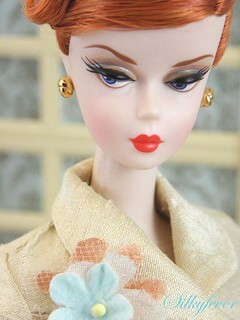 I adored this jumpsuit and pushed it aside, thinking at some point I would find the right doll to wear it. Rewind even further to Black Friday in December, to another Instagram post I made about purchasing a vintage Barbie find at a local antique shop … two pair of vintage Barbie wedges. 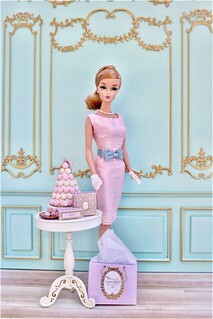 During that same visit to the same shop, a different vendor had a very troubled vintage Titian Twist N Turn Barbie. I picked her up, looked her over, and dismissed her. Too much work. Surely her hair would never be tame again. Fast forward to Monday of this week, and I found myself back at the antique shop on a shopping date with my hubby. I was secretly rooting for the messed up TNT to still be tossed about on the shelves on which I had originally found her. I visited the vendor’s booth, couldn’t find her, and moved on. But I made my way back a short while later. I searched more diligently. And sure enough there she was. Tossed aside and completely neglected. I showed her to my husband and I commented on what rough shape she was in. So dirty. Could her hair ever be tamed?! Her knees did click, and her rooted eyelashes looked to be in nice shape. But seriously, for $25, why would I be so indecisive? I told myself I could easily shave her head and put a wig on her, worst case scenario. And I reminded myself that I **desperately** needed a MOD doll to model that Jump Into Lace jumpsuit back at home. So I walked up to to the counter with her, and being the cheapskate that I am, demanded an additional $5 discount, of which I was granted. On Monday I posted a pic of her on my Instagram and had a very helpful person give me some tips on smoothing out that mess of a head of hair. I decided if it didn’t work out, I would just revert to my shave plan. But to my surprise, she cleaned up BEAUTIFULLY! Yes, she’s a tad thin on top, but for $20, I’m not going to fret. This is just one more reason why I thoroughly enjoy this hobby – I am constantly being surprised by tiny little treasures that just make my day. No one was going to take the poor orphan in, except for a Barbie Collector, and it turns out a NON-MOD collector adopted this beauty. I’m now in complete LOVE. Isn’t she adorable?! Yes, this is the extent of the MOD in my collection. I believe that will change going forward as I have a renewed appreciation.